The number of times clients have said to me “Oh just do the logo in any colour you want. It doesn’t really matter what colour it is, right?’. Err… WRONG! Colour is one of the most important factors in how your business appears to your potential customers, and how your potential customers see and feel about your business. Colour has a deep and profound effect on our subconscious minds. It even affects our behaviour… and this could mean big things for your business. 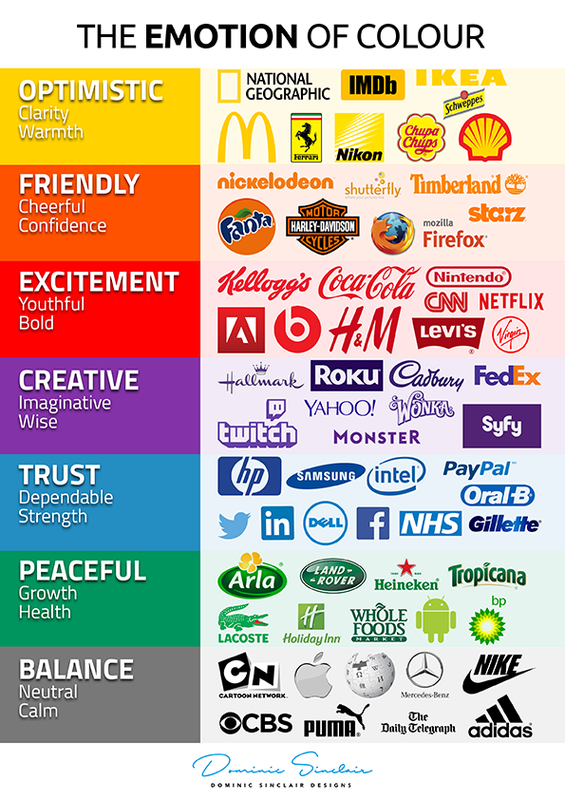 Colour is the first thing consumers remember about a brand. For example, if I said ‘Coca-Cola’, what is the very first thing that comes to your mind? The colour red, right? The colour red brings to mind thoughts and feelings of ‘exciting’, ‘attention-grabbing’, ‘warm’, ‘love’, ‘anger’, ‘life’, and ‘comfort’. Colour is the first thing a consumer remembers about any brand, followed by shapes, then numbers and last of all… the words. We humans have millions of light-sensitive cells, or receptors, at the back of our eyes. Science considers these receptors as an extension of the brain, and for good reason. Certain receptors are stimulated by the light coming into our eyes, and those receptors then send impulses to our brain. The brain takes those signals and interprets them as colour: in the case of Coca-Cola, red. Because the brain is interpreting the colour, that means that colour is, by its very nature, a sensation, and sensations are deeply personal. It’s this fact that makes our choice and use of colour so critical to the success of our businesses. A good brand is all about the emotion it conjures up in the minds and bodies of your potential customers. Getting this part right is crucial to your commercial success, which is why it is important to get your logo and branding created by a professional designer. Believe it or not, I am confronted almost on a daily basis by designers who don’t have the first idea about the importance of colour to an overall branding project! ‘Why have you given that company name a purple colour?’. OK. That may be the case, but does that colourway convey everything the company owner wants his customers to ‘feel’? Possibly not! For example, Harley-Davidson would not have the same brand qualities its logo and branding were shades of pink! Equally, Fischer-Price would not look too good as a childs toy manufacturer if its branding was black! Red. Exciting, attention-grabbing, warm, and connected to love, anger, life, and comfort. Yellow. Adventurous, evoking happiness, enthusiasm, youth, and travel. Green. Money, but it’s also known for its connection to balance, health, sustainability, and knowledge. Blue. Honesty, high quality, competence, trust, reliability, and integrity. Pink. Love, compassion, romance, gentleness, wellbeing and sophistication. Brown. Friendly, organic, natural and rugged. Black. Sophistication, intelligence, seriousness, and expense. White. Order, innocence, purity, cleanliness, neutrality, and space. Grey. Timelessness, neutrality, refinement, of the moment, or practicality. As culture and context can greatly affect the psychology of any colour, it is always wise to do your due diligence and research these things as well as your audience in order to make the best choices for their specific backgrounds. It may seem like an artistic decision, but the colour you choose for your design/branding has a significant psychological impact on how people perceive it. One of the main reasons I chose a light blue for the Pin iT Ltd branding is because it says ‘dependability’, ‘friendliness’, ‘trustworthiness’ and it says to their customers that they (Pin iT) are an approachable, honest and quality brand. Definitely something I would look for if I was buying my child a top of the range, ultra-secure GPS watch. Studies have clearly indicated that colour makes a massive difference in how signage and advertisements are read. 42% more signs and advertisements are read when colour such as red is used versus simple black and white. Comprehension of those ads is also boosted with colour use. Remember: While it is important WHAT colour you chose, it’s also important that you chose colours that highlight and accentuate the personality you want your brand and products to reflect. Branding is all about experience and emotion.